A romantic comedy set among Singapore's hyper wealthy set, Crazy Rich Asians freshens up the context but otherwise just recycles old and stale genre cliches. In New York City, Nick Young (Henry Golding) convinces his girlfriend Rachel Chu (Constance Wu) to travel back with him to Singapore to attend a friend's wedding. Rachel is an economics professor at New York University, but knows little about Nick's family background. Upon arrival in Singapore, it becomes apparent the Youngs are incredibly rich, own half the island city-state, and have set high expectations for any future wife of Nick's. Rachel was born and raised in the US and her modest family background is simply not good enough for Nick's domineering mother Eleanor (Michelle Yeoh). In the lead-up to the wedding she struggles to fit in and prove her worth. She meets various members of Nick's family, including his cousin Astrid (Gemma Chan) who has marital problems of her own. Rachel's old friend from college days Peik Lin (Awkwafina) tries to help navigate the local culture and customs. Directed by Jon M. Chu, Crazy Rich Asians is a Hollywood-backed adaptation of the Kevin Kwan novel, with an all-Asian cast. Set primarily in a foreign culture and breathing deeply from the customs of exceptionally affluent but nevertheless traditional Asian families, the film tells its story with fresh faces in fresh places, and adds plenty of flashy style and attractive Singaporean scenery. But unfortunately, it's the same old story. 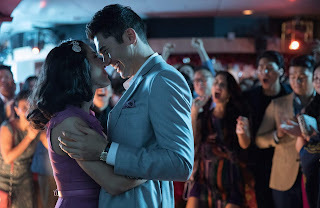 A fish-out-of-water modest girl trying to win the support of a vehemently disapproving potential future mother-in-law is a yawn-inducing tired premise, and for all the razzmatazz and colourful background characters thrown onto the screen by Chu and screenwriters Peter Chiarelli and Adele Lim, at its core Crazy Rich Asians is exceptionally familiar. For a long stretch Nick and Rachel become passengers in their own movie, as a parade of the wacky, wealthy and wicked move across the screen. In addition to the disapproving mother Eleanor, Rachel gets to meet the icy Astrid, the elderly family matriarch Shang Su Yi, as well as Nick's spiteful former lover Amanda, plus a large assortment of other family members, friends and hangers on. A few are supportive of Rachel but others live down to what it means to be rich, stupid and condescending. Some of the subplots, including Astrid's disintegrating marriage to her husband Michael, nursing a pointed inferiority complex, are agonizingly underdeveloped. But carrying the film through all its rough patches is Constance Wu, who delivers an agreeable performance and frequently rises above the material. While Henry Goulding is often a blank slate and the rest of the actors are loyal to their mono-dimensional characters, Wu portrays a smart woman in love, navigating a new culture and admirably standing up for herself. The Young family are Crazy Rich Asians capable of hosting the most lavish parties, but even they cannot escape the clutches of routine romantic comedy trappings.